"A wonderful light salad that's easy to make. I use tomatoes from the farmer's market and it gives the salad that special 'fresh' zing. My family loves it." 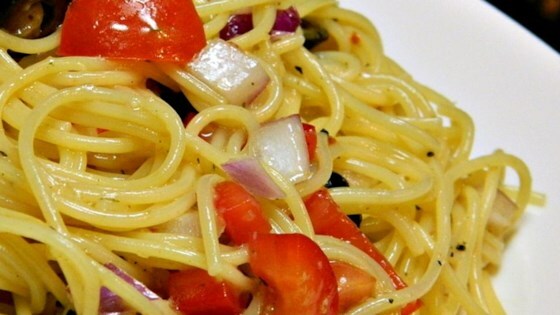 In a large bowl, combine the pasta, tomato, bell pepper, olives and onion. Whisk together the salad seasoning mix and zesty salad dressing. Pour over salad and toss gently. Refrigerate 4 hours or overnight to blend flavors. This was just perfect for what I needed! It was tasty, simple, fast, and I already had most of the ingredients. My husband loved it! I loved the flavor of this, but next time would use some other type of pasta. This is a very tasty pasta salad. I really enjoyed it. I used a sweet onion, half the amount of olives, corkscrew pasta, and added some fat free feta and it was great! My husband says, "Tell em 'Awesome!' from me." " I can see us eating this on a veranda with a great bottle of wine and french bread." Basically it transformed him to another place. Thank you! Easy, light and tasty. Very good. Great tasting pasta salad. I added some chopped cilantro and lemon juice. Everyone enjoyed it. Will make this again.